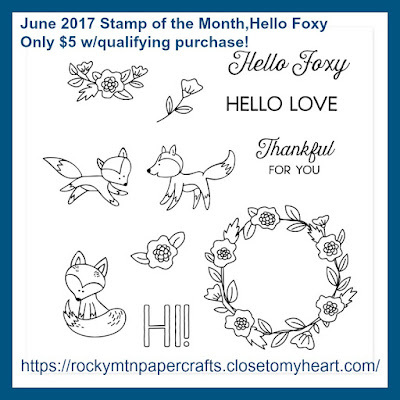 Say Hello to the June Stamp of the Month, S1706 Hello Foxy! This super cute set of flowers, foxes and sentiments will be a versatile addition to your stamp collection. I hope to have some fun creations with the set later this week! You can add this set to your collection for only $5 in the month of June with a qualifying purchase or you can purchase at the retail price of $17.95. You can view all of the great Close To My Heart products in my online store! 25% Off Cardstock in June! Legacy Albums-Buy 1, Get second 1/2 off! FLASH SALE!!! 30% OFF SELECT ITEMS!